Have you noticed this trend lately? A subtle move away from whites and pale greys, to embrace the drama of deeper, richer hues? Don't get me wrong - light tones and whites will always sweep me off my feet, but a dramatic black wall can really set the space off - nothing like some contrast! 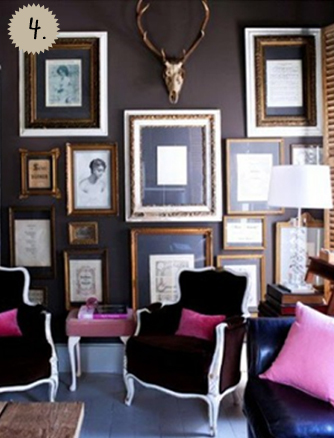 I wouldn't mind a small dark wall in my place. Would you embrace the dark side? Nice post! I don't think I would paint any rooms black, but I can get on board with a charcoal or a chocolate or even a deep green or blue. When I am finally able to buy a house (instead of renting), I fantasize about having a small room (a guest bath or a foyer, perhaps) in a deep, dark shade. It makes everything pop. And despite all the advice to the contrary about making a small space seem smaller, I vote for cozy. :) Your blog is always such a treat. 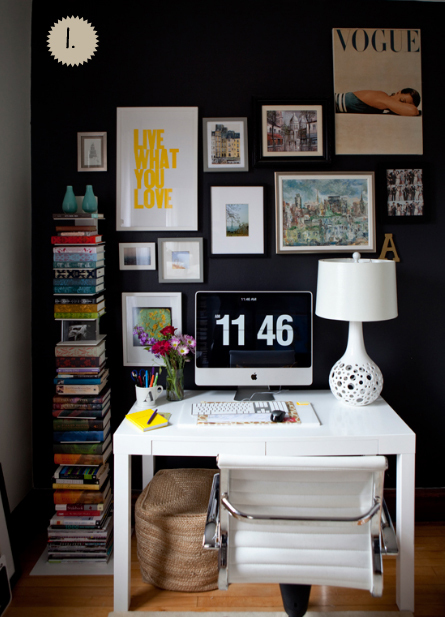 LOVE black walls with a gold mirror......just like picture #2! These images are so aesthetically pleasing! Love it, so inspiring! ahh simplicity. Following :) Would be awesome if you could check us out and perhaps follow! Just started following today, great blog! I love these images especially the first one. 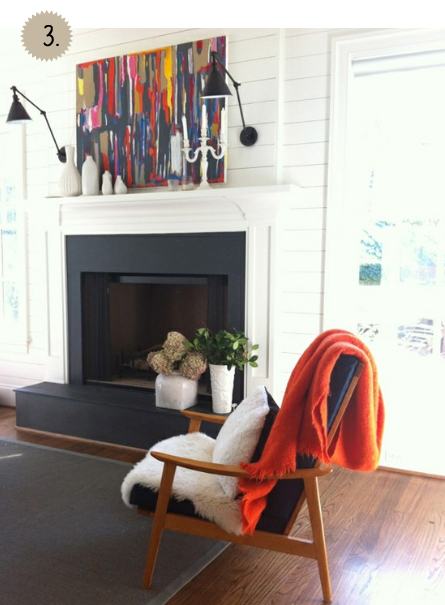 I've been wanting to paint a wall or two black accented with white furniture and accessories. I think that may have to happen soon! LOVE dark walls and that second image with the gold mirror is amazing! I love the contrast of the gold against the black - so glam! I am so tempted to paint one wall black and hang a dramatic mirror...but I rent and am constantly reminded by my smarter half that if and when we move I will need to paint it back to white...and that will be a nightmare. Ugh.